I’ve been in the licensed sports business for the last 15+ years and I’m currently immersed in the business of sports art – good art, not the crummy stuff, but more on that in a moment – so when a close friend asked me if I could suggest my Top 10 Gifts for a Sports-Minded Dad for Father’s Day, it got me thinking. And so here is what I came up with – not only a list of the Top 10 Gifts for Sports-Minded Dads, but also a list of the Top 10 Gifts Not To Give. 1. A Pair of Badges to the Masters – Rain or shine, Thursday or Sunday, it’s the whole stepping-back-in-time feel that is the real Masters experience. No cell phones? Beer for two bucks? Bar-B-Q sandwiches for a buck and a half? Drink it all in and forget the rest of the world for a day in a place where if time doesn’t stand still, it at least slows to a crawl. 2. Buy a pair of bleacher seats at Wrigley Field for a Cubs Game – and while in Chicago, do a little sightseeing in one of America’s greatest cities, have a great steak dinner and go for a couple of afternoon beers at a neighborhood bar. And if you can, try to do more listening than talking. 3. Take a three day road trip together – include a round of golf almost anywhere, a big league game (MLB, NFL, NHL or NBA) and a small town minor league game, any sport. At some point along the way, thank your Dad for having gotten you this far. And if you have a brother, invite him too. And do more listening than talking. 4. 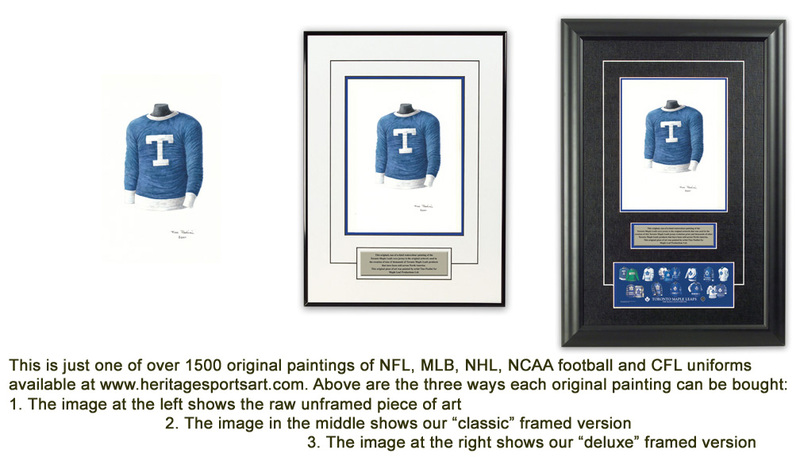 Buy a beautiful original watercolor painting from Heritage Sports Art. I know it’s a bit of a shameless plug, but we have a very limited collection of fantastic paintings of historic uniforms from more than 100 NFL, MLB, NHL and NCAA football teams, and once a piece is sold, it’s sold. 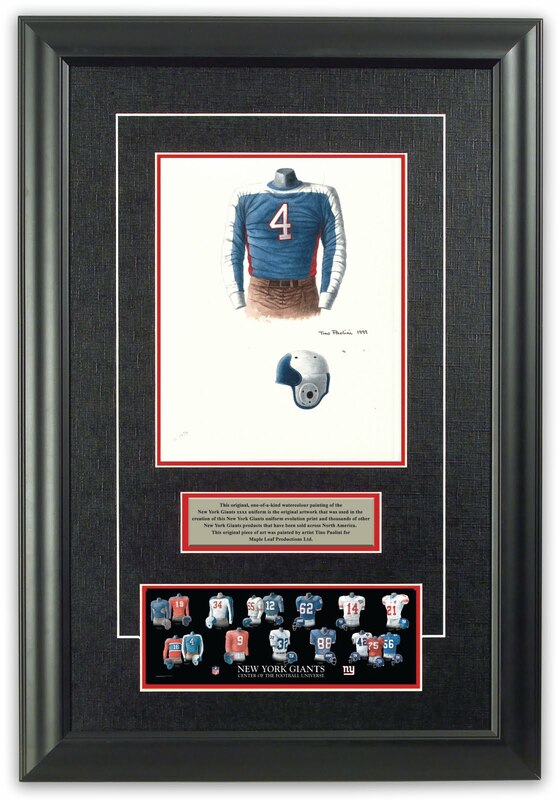 This is really beautiful art that is also “somewhat famous” (our website Heritage Sports Art and Youtube videos will explain), comes nicely framed and will be an instant family heirloom that any sports-minded Father would truly love. 5. An NFL Sunday - Give your father an entire NFL Sunday of father and son time at your father’s home with no distractions, some great games on TV, a few drinks and an array of Dad’s favorite food. Run blocking ahead of time on mom or anyone else who might disturb the day. And again, do more listening than talking. 6. Go Cuban - Buy a dozen Cuban Cigars and share one of them with Dad. I know it’s not overly sports oriented, but cigars and sports are joined at the hip in many ways, so we’ll include this as a sports minded gift. Smoking a good stogie and pushing the limits of the law (if you’re American) with your Dad - it doesn’t get much better than that. 7. Turn the hands of time back - Track down a DVD copy of a great game in its entirety from 30 or 40 or 50 years earlier involving your Father’s favorite team and promise to sit with Dad, watch the game from beginning to end, enjoy his company and have a beer or two. Drink in the fans’ clothes, the lack of commercialism, the equipment the players are wearing. And do more listening than talking. 8. 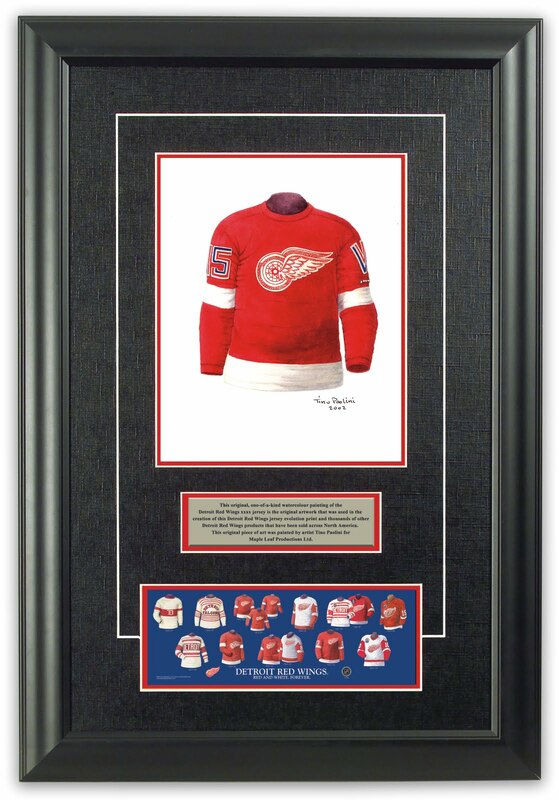 Buy a game worn jersey from 20 or 30 or 40 years ago – They can be expensive, but with a little patience you can find lots of great game-worns at auction for less than $1500 and some for under $500. But don’t put it in a display case, encourage your Dad to wear it. It doesn’t need to be autographed and doesn’t need to have belonged to the best player on the team, it just needs to be a great “old-school” jersey from his favorite team – something with a little history - and something he might wear on a “Game Day”. I still think of a friend of mine who as a kid was given a game-used Bobby Orr stick and broke it in his driveway playing street hockey. The broken Bobby Orr stick means more to him and tells more of a story than if it was mounted unbroken in a Plexiglas case on the wall. 9. Play a round of golf at a golf course you played at together when you were a kid – I know this doesn’t apply to everyone, but if you were lucky enough to play some golf with your dad when you were younger, have another round together at the same course whether it’s a cow pasture or Pine Valley Golf Club. Bring a camera, enjoy his company and try your best to do more listening than talking. 10. Take Dennis Hull to dinner - Your Dad may not be a hockey fan, and he doesn’t have to be, but if you have the chance to take Dad to dinner with ex-NHLer Dennis Hull, book it! By the end of dinner your sides and cheeks will be so sore from laughing you’ll be begging for mercy, and you will have shared an experience you won’t soon forget. 1. A Tie – Nothing says lame like a tie for Fathers’ Day – couldn’t you have at least gotten him something slightly more useful, like a fax machine, fedora or a cooking class? 2. A Ceramic Ashtray made from a hand-print – Enough said. 3. A Self Help book – Might as well buy Mother Teresa a book on religion. 4. Gloves, Socks or Underwear – There is a rule that some things should only be purchased by the person who is going to wear them. Obey the rules. 5. A Wallet – Some things are too personal to be left to someone else to decide, far more personal than socks and underwear. A wallet is one of them. 6. Anything from Oprah Winfrey – Oprah’s got game, but she’s not for Dad. 7. Flowers – This is Fathers’ Day you knucklehead. 8. A Fruit Basket – Who ever heard of a dad eating fruit? 9. New slippers – One pair should pretty much last a lifetime, who needs a new pair? 10. An ascot – Even Thurston Howell III had trouble pulling that one off. Happy shopping and more than that, Happy Fathers’ Day! And more than anything else, in life and on Fathers’ Day, please try to do more listening than talking. Just the quickest of blogs to let you know that I have recently loaded all the Cleveland Indians (previously known as the Cleveland Blues 1901, Cleveland Broncos 1902 and Cleveland Naps 1903-1914) uniform images, 17 images in total, to Flickr and to Facebook. Flickr: You can see all the Cleveland Indians uniforms here. Facebook: You can see all the Cleveland Indians uniforms here. 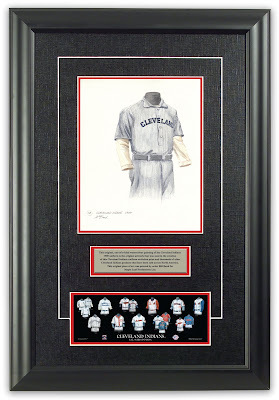 These are highly detailed, original watercolor paintings, created to celebrate the history of the jerseys of the MLB Cleveland Indians franchise (previously known as the Cleveland Blues 1901, Cleveland Broncos 1902 and Cleveland Naps 1903-1914). 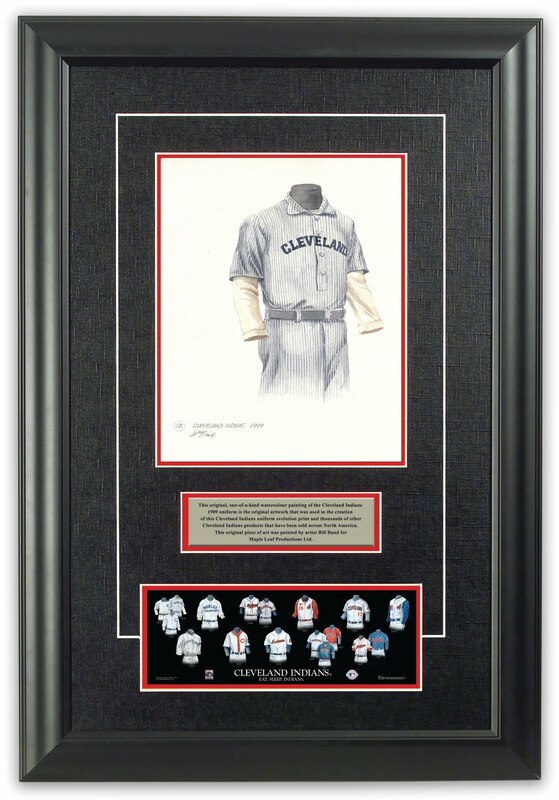 Each of these 17 original paintings, and more than 1500 other MLB, NFL, NHL, NCAA football and CFL uniform paintings, is available for sale at our Heritage Sports Art Cleveland Indians web page. Just the quickest of blogs to let you know that I have recently loaded all the Cincinnati Reds uniform images, 16 images in total, to Flickr and to Facebook. Flickr: You can see all the Cincinnati Reds uniforms here. Facebook: You can see all the Cincinnati Reds uniforms here. 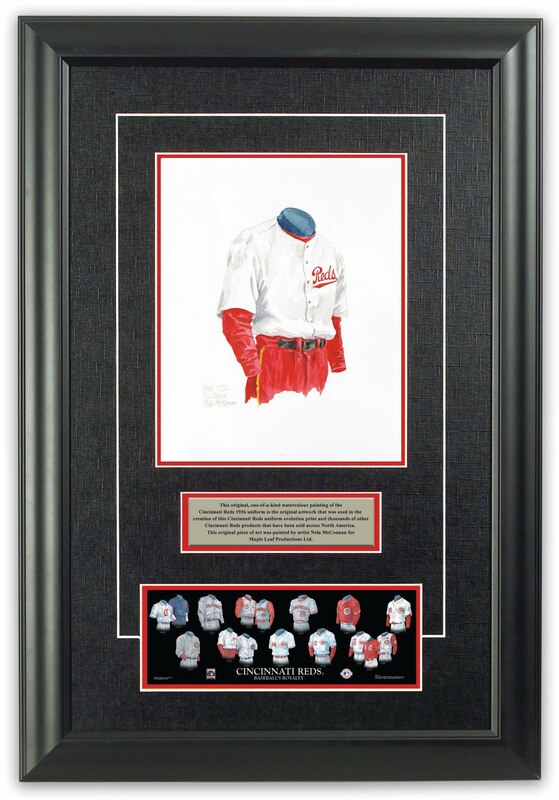 These are highly detailed, original watercolor paintings, created to celebrate the history of the jerseys of the MLB Cincinnati Reds franchise. 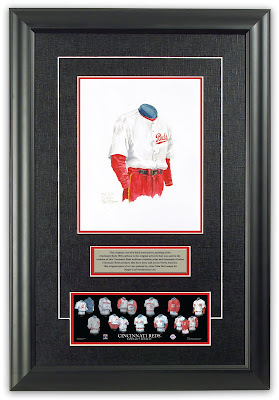 Each of these 16 original paintings, and more than 1500 other MLB, NFL, NHL, NCAA football and CFL uniform paintings, is available for sale at our Heritage Sports Art Cincinnati Reds web page. Just the quickest of blogs to let you know that I have recently loaded all the Chicago White Sox uniform images, 14 images in total, to Flickr and to Facebook. Flickr: You can see all the Chicago White Sox uniforms here. 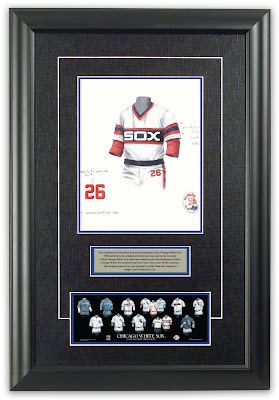 Facebook: You can see all the Chicago White Sox uniforms here. These are highly detailed, original watercolor paintings, created to celebrate the history of the jerseys of the MLB Chicago White Sox franchise. 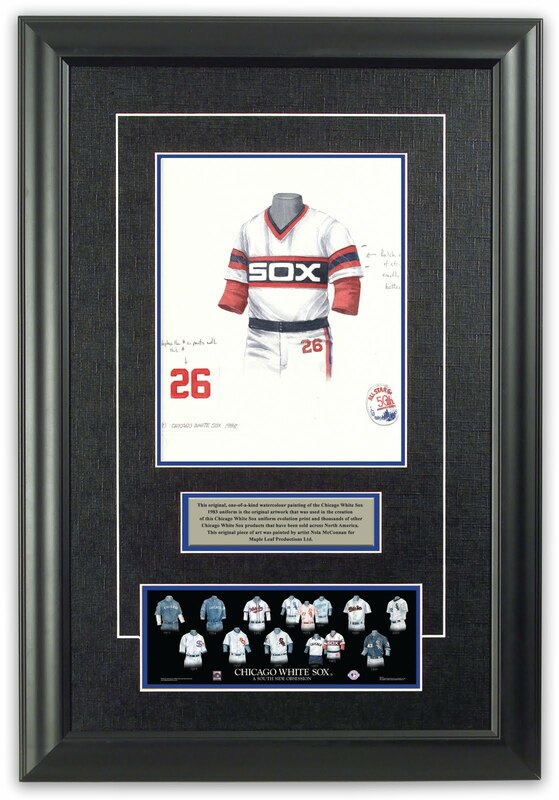 Each of these 14 original paintings, and more than 1500 other MLB, NFL, NHL, NCAA football and CFL uniform paintings, is available for sale at our Heritage Sports Art Chicago White Sox web page. Just the quickest of blogs to let you know that I have recently loaded all the Baltimore Orioles (initially the Milwaukee Brewers in 1901, then the St. Louis Browns from 1902 to 1953) uniform images, 14 images in total, to Flickr and to Facebook. Flickr: You can see all the Baltimore Orioles uniforms here. 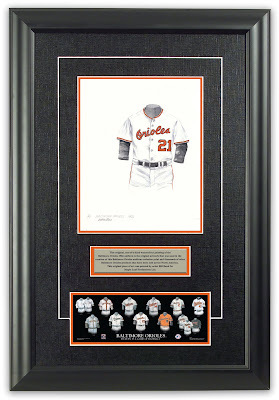 Facebook: You can see all the Baltimore Orioles uniforms here. These are highly detailed, original watercolor paintings, created to celebrate the history of the jerseys of the MLB Baltimore Orioles franchise (initially the Milwaukee Brewers in 1901, then the St. Louis Browns from 1902 - 1953). 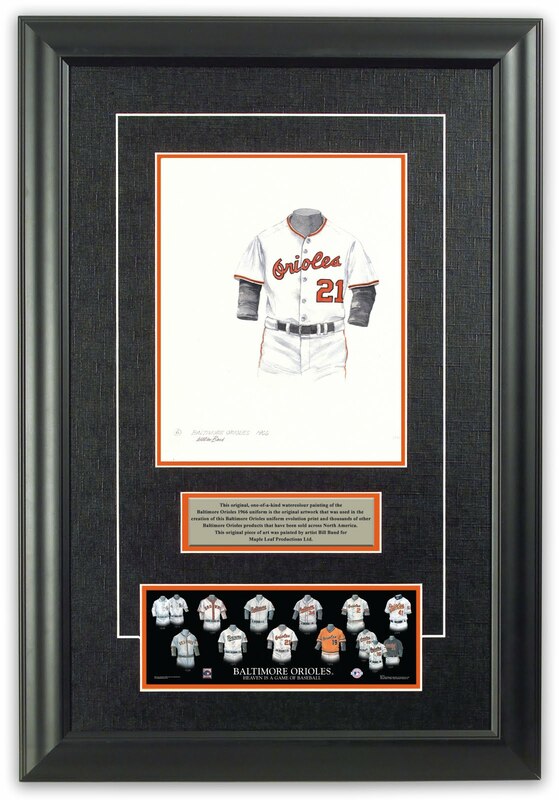 Each of these 14 original paintings, and more than 1500 other MLB, NFL, NHL, NCAA football and CFL uniform paintings, is available for sale at our Heritage Sports Art Baltimore Orioles web page. People ask me all the time for trivia challenges for their favorite team, so I decided to learn how to do this - initially using an app from a company called "Wildfire" who designed a trivia app for use with Facebook. Although I have reproduced the questions below, if you want to answer the questions and see how many you get right, you'll need to take the quiz in Facebook or on Wildfire's trivia site. The first quiz I have done happens to be the Detroit Red Wings - why the Red Wings? I'm not 100% sure - it just came to me. The Trivia Quiz on Wildfire's "Microsite"
As always, feedback is welcome and please share with Red Wings fans! More Trivia Quizzes to follow. 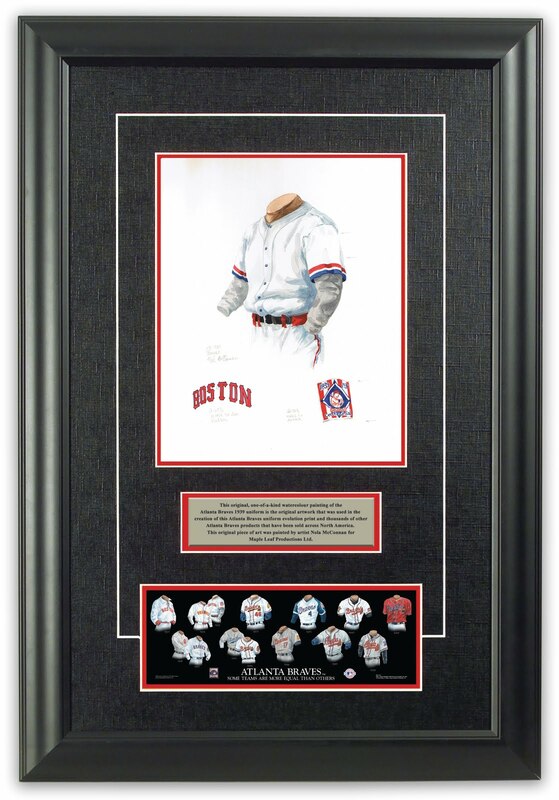 PS This stop-you-in-your-tracks beautiful framed piece of art, and over 1500 others each featuring an original watercolor painting of NHL, NFL, MLB or NCAA uniforms, is available for sale at Heritage Sports Art. 1. When they first entered the NHL in 1926-27, the Red Wings were known as the Detroit Cougars. Why? A. Detroit’s MLB team was the Tigers, their NFL team the Lions, so Cougars were a natural third team name. B. Detroit had been the home of a popular minor league hockey team known as the Cougars. C. When the Western Hockey League closed its doors, the Victoria (British Columbia) Cougars moved east to become the Detroit Cougars. D. The Detroit Free Press ran a contest and Cougars was the most popular team name capturing 34% of the votes. 6. When Detroit entered the NHL in 1926-27, how many teams wore two-color uniforms? 7. What is the origin of the Red Wings’ winged wheel logo? A. Team owner james E. Norris once played for the Montreal AAA hockey team, whose nickname and logo was the winged wheel. B. The winged wheel pays tribute to Detroit’s already longstanding position as the center of the US auto industry. C. The winged wheel was the logo of a highly popular minor hockey league team in Detroit. D. The Norris family chose 7 possible team logos and the readers of the Detroit Free Press decided on their favorite logo – 26% chose the winged wheel. 8. How many of the Red Wings’ 11 Stanley Cup Championships were won with final series sweeps? 9. The Wings played their final game at the Detroit Olympia on December 15, 1979, but when was the Olympia actually demolished? Just the quickest of blogs to let you know that I have recently loaded all the Atlanta Braves (initially the Boston Braves, later Milwaukee Braves) uniform images, 15 images in total, to Flickr and to Facebook. Flickr: You can see all the Atlanta Braves uniforms here. Facebook: You can see all the Atlanta Braves uniforms here. These are highly detailed, original watercolor paintings, created to celebrate the history of the jerseys of the MLB Atlanta Braves franchise (initially the Boston Braves, then the Milwaukee Braves). Each of these 15 original paintings, and more than 1500 other MLB, NFL, NHL, NCAA football and CFL uniform paintings, is available for sale at our Heritage Sports Art Atlanta Braves web page.